In short, all the traditional elements of Arab-Andalusian culture. And then discover the tranquility and freshness of the patio, the murmur of the fountain in the middle of the orange trees in his garden. The rooms, the larger and more finely decorated, are on the ground floor. The other bedrooms are on the 1st floor. Above is the terrace, or you can enjoy panoramic views of the Medina. Live some time in the riad, is above all a way of life, a privilege. This is a time in history to live. 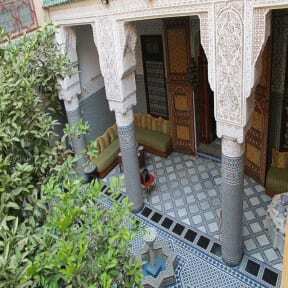 Riad Les Chrifis is located in the Medina. It features a patio with a fountain, a terrace with a Medina view, and a Moroccan living room. Free Wi-Fi is available at all areas. All accommodations are fitted with air-conditioning and a satellite TV. Suites offer a seating area. Each room includes a private bathroom equipped with a shower. On request, guests can enjoy local cuisine in the dining area. 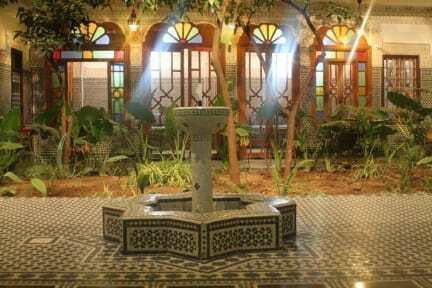 Riad Les Chrifis is a 10-minute drive from the city centre, 77 km from Ifrane city and 18 km from Fes-Saïss Airport. An shuttle to the airport can be arranged.